BABAR is a high energy physics experiment at the asymmetric electron-positron collider PEP-II at the Stanford Linear Accelerator Center (SLAC). Its aim is to measure CP violation in B-meson decays and is related to the question of the matter-antimatter asymmetry in the universe. BABAR is one of originally three experiments that were built for this purpose. The other experiments are BELLE at KEK in Japan and CLEO at CSER in Connel, USA. B-mesons (and anti-B-mesons), that are mesons containing b-quarks, are produced in electron-positron collisions and decay afterwards into many possible final states. The Babar detector is built for reconstructing these B-meson decays. The measured decay time distribution of B-mesons and anti-B-mesons, which decay into the same final state with defined CP quantum numbers, are not equal. This reflects CP-violation in the B-meson system as illustrated in the figure shown. In the universe, there is an imbalance between matter and anti-matter, which is called matter-antimatter-asymmetry. The formation of baryons and anti-baryons in the early universe, called baryogenesis, has to explain this asymmetry. 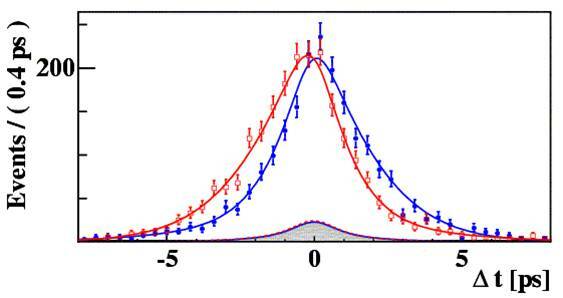 One essential ingredient for a dynamical generation of more matter than anti-matter is CP-violation. The amomunt of observable CP-violation in the B-meson-system can be predicted by the Standard Model and is generated through a phase in the Cabibbo-Kobayashi-Maskawa (CKM)-matrix. This matrix connects the weak interaction eigenstates of quarks (or anti-quarks) to the mass-eigenstates of the quarks. The Standard Model prediction of CP-asymmetries in the B-meson system can be checked with the measurements of the BABAR experiment.